(Clay County, Indiana) - The rural county is located in west-central Indiana approximately 15 miles east of Terra Haute. The small county is home to approximately 27,000 people, scattered throughout the rural landscape. Approximately 8,000 of the inhabitants live in the county’s largest town, Brazil. Spotted throughout the county are seven elementary and three secondary schools that create the Clay Community Schools. The homegrown students of the Northview High School’s marching band are well known for their successful state competitions, which they have spent the majority of the last 19 years ranked in the top four. All of the community schools contribute to the great education of the children in the 10 Clay County townships and the one surrounding township. 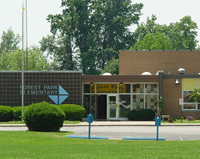 The four elementary schools each operate their own systems individually. Each is equipped with two boilers and a chiller. In addition to controlling these units, KMC digital products are also controlling numerous air handling units, unit vents, fan coil units, and exhaust fans that are located in the restrooms and locker rooms.